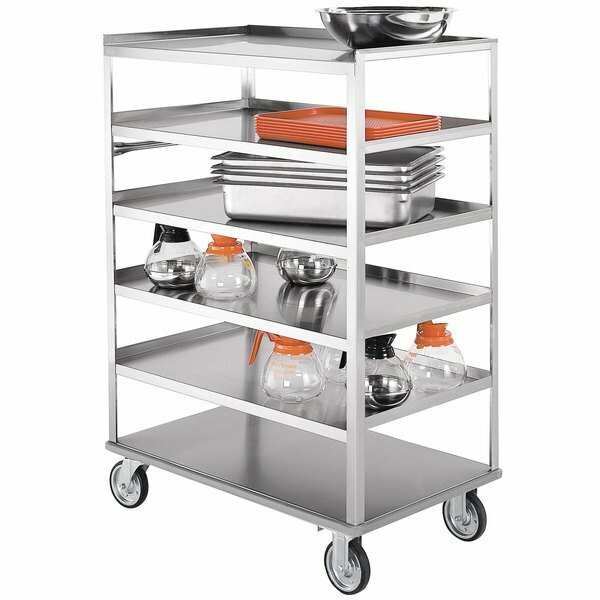 Lakeside 451 Medium-Duty Stainless Steel Eight Shelf Utility Cart with 3 Edges Up and 1 Down - 36 3/8" x 22 1/4" x 54 1/2"
Safely transport bus tubs, plates, beverages, and more throughout your foodservice operation with this versatile kitchen essential. The Lakeside 451 stainless steel eight shelf utility cart boasts multiple shelves to keep trays and supplies organized in a compact footprint, while also allowing for easy maneuvering through any space. This item boasts eight 21" x 35" shelves with a clearance of 5 3/8". Raised edge shelves hold items on the shelf during transport, while one edge is down to make loading and unloading easier. Stainless steel construction adds extended durability, in addition to making the item easy to clean and sanitize when not in use. Two fixed and two swivel 5" casters make turning easy. Other features include all welded leg construction, a no-mark cushion tread for quieter operation, and a perimeter strip bumper that adds extra protection for walls and furniture. The Lakeside 451 utility cart is recommended for medium-duty use and features a 500 lb. weight capacity.